DESCRIPTION OF THE BOOK: Twelve-year-old Sophie Brown feels like a fish out of water when she and her parents move from Los Angeles to the farm they’ve inherited from a great-uncle. But farm life gets more interesting when a cranky chicken appears and Sophie discovers the hen can move objects with the power of her little chicken brain: jam jars, the latch to her henhouse, the entire henhouse…. 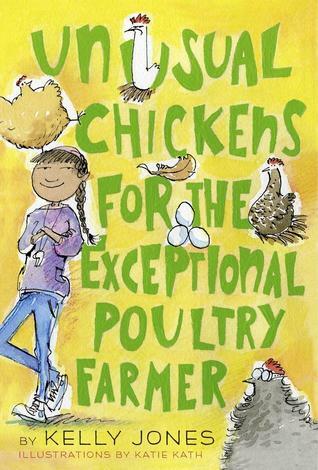 Unusual Chickens for the Exceptional Poultry Farmer releases May 12 with Knopf Books for Young Readers. MY TWO CENTS: It’s easy to love Sophie, the half-Latina main character in this middle grade novel that upgrades the “new girl in town” idea by adding cool, magical chickens and letters from the beyond. Sophie and her parents move from Los Angeles to a farm, left to them by her late Great-Uncle Jim. The farm, though, is “more like a big, boring garden. Dead-looking grapevines and blackbirds and junk piles and bugs, that’s it.” Sophie’s family is trying to start over after her dad lost his job. In the novel, author Kelly Jones addresses issues such as unemployment, racism, and classism, but never in a heavy-handed way. Through her letters to her abuela, Uncle Jim, and Agnes from Redwood Farm Supply, Sophie talks about her family’s financial problems and the small town’s lack of diversity. “There aren’t any people around here–especially no brown people.” In another chapter, Sophie writes, “even though Mom was born here and speaks perfect English, she says you have to be twice as honest and neighborly when everyone assumes you’re an undocumented immigrant.” These moments, though, are not preachy. Instead, they are presented as things Sophie observes or wonders about as she navigates her bicultural reality and being the new girl–a city girl transplanted to a weed-choked farm with magical chickens. And, for the record, the chickens are awesome. My favorite is the angry, telekinetic chicken. He’s so cute somehow even though he’s got the “if looks could kill” face all the time. Being responsible for the chickens helps Sophie to settle in and connect with her new surroundings. Caring for the chickens, and working hard to keep them safe from a thief, allows Sophie to develop her confidence. What I really love about Sophie is that she’s a strong girl, but she’s also a quiet girl who isn’t afraid to admit when she’s sad or lonely. Being strong doesn’t always mean wielding weapons; sometimes it means going after a chicken thief or speaking in front of a crowd, even though it scares you. I think lots of middle grade readers will love this novel, which also has great illustrations, information about chickens throughout, and even a recipe for migas! TEACHING TIPS: Language arts teachers could easily include this novel in a thematic literature circles unit with other stories about moving to new places, whether it’s to a new town or a new country. Since Sophie writes letters throughout the novel, students could write and send personal letters to friends or family and formal business letters to local companies. In this electronic age, writing, sending, and receiving letters could be a fun activity for this generation of students, who may have seldom done this, if at all. Asking a local farmer to visit the classroom, or taking students on a field trip, would be a wonderful experiential activity, especially for city students (like Sophie) who may have never visited a farm. A classroom fiesta, complete with lots of eggs-based dishes and migas, using the recipe in the book, would be a wonderful and tasty way to end a unit. ABOUT THE AUTHOR: Kelly Jones is a curious person, interested in chickens, magic, farm life, spies, sewing, the odd everyday bits of history, how to make sauerkraut, how to walk goats, superheroes and what makes them so super, recipes to make with a lot of eggs, anything with ghosts (particularly friendly ghosts), how to draw chickens that actually look like chickens, and any story she’s never heard before. 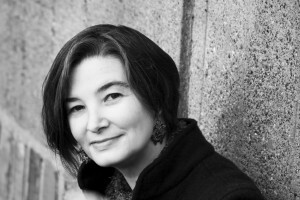 She’s also a writer: Her debut novel Unusual Chickens for the Exceptional Poultry Farmer, about twelve-year-old Sophie and her magical chickens, is forthcoming from Knopf Books For Young Readers in May of 2015. Her second book, Glamour, is set in 1818, England, about sixteen-year-old Annis, who would like to become a spy like her father and who does not see why the War Office should put up such a fuss (with bonus magical dressmaking!) is forthcoming from Knopf Books for Young Readers in Spring of 2017. FOR MORE INFORMATION ABOUT Unusual Chickens for the Exceptional Poultry Farmer visit your local library or bookstore. Also, check out WorldCat.org, IndieBound.org, Goodreads, Amazon, and Barnes & Noble.